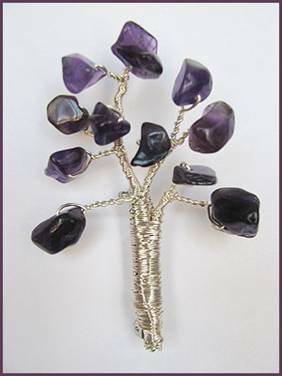 This great wire wrapped gemstone chip tree brooch tutorial by Albina Manning can be customized in so many ways. It is like a modified tree of life design. You could wire the tree with more branches and make it fuller. Mix the chips or substitute with beads to give it a different look. Perhaps even make a resin clay vase which can attach to the brooch finding with ease due to its adhesive properties. Those are just a few ideas which popped into my head when I first saw it. Another idea comes from this past post for a different style of tree brooch where you could introduce family birthstone colors. I also love these Pin Brooch to a Pendant Converters . If you are reasonably adept at wire work, you could make your own based on a wire coil for the tube part. You can see how I converted some brooches into pendants in this past post How to Make Convertible Brooch Pendant Necklaces. Oh boy! This is going to have me diving into my collection of gemstones - wheeeeee!! Gemstone chips are so inexpensive so this is a great way to use them! I like the way the pin is hidden by wrapping that also hides all the "stems".